Gerry Hitchens joined the Harriers after being spotted by the then secretary of the Harriers, Ted Gamson, while playing for the Highley Miners in a cup final at Aggborough in 1953. Almost straight away Gamson offered him a contract knowing that bigger teams like Bolton were already watching him. He debuted for us in the Worcester Senior Cup against Cradley Heath and scored but he failed to build on that and had to wait until the following season when we played Bloxwich and he scored a hat-trick. Still he couldn’t make the first team but we did offer him a better, improved contract once the big clubs started to show an interest once more. When he did eventually make the first team he scored four times in the first five games but then found himself dropped again until five months later he was re-called towards the end of the season and scored twice more. The following season he was back in the reserve team! Again he made his way back and he then became a regular fixture in the side and at one stage scored six times in seven games which meant that once more the big clubs started to show an interest. 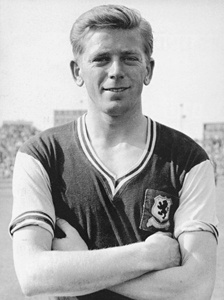 WBA and Aston Villa were amongst those showing an interest and eventually in January 1955 he played his last game for us before joining Cardiff City for £1,500. He spent three seasons at Ninian Park before leaving to finally join the Villa for £22,500, far more than they originally baulked at paying for him. In 1961 he played his first game for England against Mexico. He scored the opening goal in a 8-0 thrashing of the South American side before going on to score twice in the 3-2 win against Italy in Rome. It was in that game that he caught the eye of Inter Milan and signed for them soon after for £85,000. Don’t we wish we had sell on clauses back then. He went on to play in 43 games for Inter Milan and scored 20 times before joining other Italian sides such as Torino and Cagliari. Now nearing the end of his career he returned to Britain in 1969 and joined our near neighbours Worcester City for two seasons before ending up with Welsh side Merthyr Tydfil for a few games before finally hanging his boots up on April 15th 1971. During his 16 year career he played 626 games for various teams and scored a total of 282 goals. His international career gained him seven caps for England and he scored five times. On 13th April 1983 he suffered a fatal heart attack while playing in a charity match. He died at just 48 yrs old and is buried in Holywell, Flintshire.